I want to show you how to make a quick fat loss breakfast today. This fat loss breakfast is called Banana and Egg Breakfast. 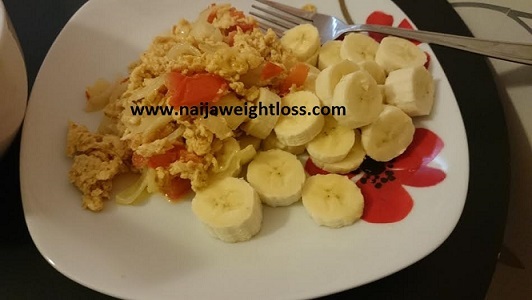 This breakfast is filling and will help you kick-start your day so you don’t eat junks. STEP 2: Peel your banana and slice into a flat pate and keep separately. Cut your pepper and tomatoes into small slices/bits. Add the cut pepper and tomatoes to your egg and beat it. Put a little Maggi and pinch of salt. STEP 3: Put 1 tablespoon of olive/coconut oil in a heated pan on cooker/stove. Put the whisked egg into the heated pan and turn it regularly so it does not stick.